It was a dramatic, tension-filled afternoon for the U.S. pairs on Saturday as they took the ice for the long program at U.S. Nationals. With a spot for the Olympic team on the line, all the teams were looking to put out their best performances of the season. Alexa Scimeca-Knierim/Chris Knierim, favorites coming into the competition, had a somewhat shaky performance in the long program, but did enough to win their second National title. The Knierims opened with their signature element, the quad twist, which earned positive quality, or grade of execution (GOE), scores. They followed with a throw triple Salchow. But in the next minute, the program threatened to unravel as the Knierims struggled with their side-by-side jumps. Both had problems on the side-by-side triple Salchow, with Alexa falling and Chris turning out. The jump was downgraded. Then Chris doubled the side-by-side triple toe loop in their combination. The Knierims then rebounded with a high throw triple flip and several strong lifts. They earned 135.50 in the LP and 206.60 overall to win the U.S. title by almost 6 points over Kayne/O’Shea. But the Knierims took some satisfaction in the elements they performed well. “It wasn’t our best skate. We do have a lot of strong elements, which I think helped us stay up in the points. But we still need to improve and we still need to get better for future competitions,” said Chris Knierim. This morning, it was announced that U.S. Figure Skating has nominated Scimeca-Knierim/Knierim to the U.S. Olympic team. “We’re just so grateful and honored to be named to the team,” Scimeca-Knierim added. The couple said they received a text message Saturday night with the news. Knierim saw the notification of the text message first. “We got both of our families together, and opened the text message on Alexa’s phone, and she read it aloud, and then we all freaked out,” he recounted. Kayne/O’Shea opened their free skate with a level 2 triple twist, which was a bit low but looked clean on the catch. Next they landed clean SBS 3S, followed by a nice throw triple Salchow, which earned positive GOE. Kayne underrotated and stepped out of the second jump in their side-by-side double Axel/double Axel sequence. She also fell on the throw triple Lutz. However, the team recovered quickly with strong side-by-side spins. Their closing star lift was impressive and perfectly set to the music, closing the program on a high note. Once again in this free skate, Kayne/O’Shea showed their special ability to take advantage of the unique energy at U.S. Nationals and connect with the crowd to create a moment that will be remembered. Kayne/O’Shea scored 131.87 in the long program and 200.80 overall. 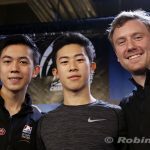 It was a satisfying result for the couple after a tough experience at last year’s U.S. Nationals, where they had to withdraw after the short program. Kayne/O’Shea’s strong performances at Nationals came as a bit of a surprise, after a lackluster showing at their first event this season, Golden Spin. The couple said that, following Golden Spin, they were able to increase the repetitions they were doing on elements, leading to greater consistency at Nationals. Kayne/O’Shea have been named to the Worlds and Four Continents teams. Deanna Stellato/Nate Bartholomay also surprised by winning the bronze medal. In only their second year together, Stellato/Bartholomay put out an energetic, ambitious long program to a U2 medley. Stellato/Bartholomay opened with a nice level 3 triple twist. They had trouble on the side-by-side triple Salchow and side-by-side triple toe/double toe combo, getting negative GOE scores on both jump passes. Their throw quad Salchow ended in a fall; however, with the high base value of the throw, they still earned 5.20 points. The second half of the program was quite strong, with a solid throw triple loop and three well-done lifts. Stellato/Bartholomay showed nice energy and commitment all the way through the program, finishing strongly. They earned 129.81 in the long program and 197.65 overall to win bronze. Their success was all the more surprising, considering that Stellato only started skating pairs a year and a half ago. “I feel like I still need to learn a lot about pairs,” Stellato said with charming candor. “I’m used to skating with myself, not with Nate. So if I come out of a jump and it feels a little weird, I’d [usually] do a back crossover and a shimmy, and then go. And Nate’s like: ‘There’s no shimmy in this program.’” Both partners laughed at this. As one of the older pairs in the event, Stellato/Bartholomay feel that their maturity is an asset. “We really bonded and felt that together,” said Bartholomay. The partners said they take equal roles in the relationship. “She really knows what she wants to do, and she takes the lead a lot on the effort and what we’re going to do that day. I take the lead a little bit more on the technical side, because I have been doing this a lot longer than she has,” explained Bartholomay. Stellato/Bartholomay have been named to the Four Continents team. They were excited about the assignment. “We’d like to skate programs similar to these [at Four Continents],” Stellato added. “I think it’s a great opportunity for them to shine and earn some points,” said Peterson, referring to world standing points. After a subpar short program, Ashley Cain/Timothy LeDuc came back with a much stronger free skate to take 4th place and win the pewter medal. Cain/LeDuc showed a lot of sass and flair in their Great Gatsby program, having fun with the footwork sections and playing expertly to the crowd. Their opening technical element was a level 1 triple twist, followed by a great SBS 3S/2T/2Lp combo (8.60 points). They also landed a good throw triple Salchow. There were a few technical issues elsewhere in the program—hand down on the throw triple flip, underrotation on the side-by-side triple loop, and a shaky star lift. But Cain/LeDuc were a hit with the audience. They scored 127.11 in the LP and 187.14 total. Cain/LeDuc have been named to the Four Continents team. Haven Denney/Brandon Frazier came into the event as defending national champions, but had to settle for a 5th-place finish. Denney/Frazier put out some strong elements in their long program: A very good level 3 triple twist, a beautiful throw triple loop, and a gorgeous reverse lasso lift. However, they struggled on their side-by-side jumps, with quality issues on their side-by-side triple toe/single toe combo and a downgraded triple toe loop. The team also lost levels on many elements—the death spiral, both spins, and even two lifts were called as level 2 or 3 (instead of level 4). The combined effect of the jump downgrade and the level losses meant their base value was 5 points lower than Cain/LeDuc’s. Denney/Frazier earned 122.69 in the LP and 186.32 overall. Denney/Frazier feel their side-by-side jumps are improving, despite the issues in the long program. Marissa Castelli/Mervin Tran, defending National silver medalists, also had some problems in the long program and wound up 6th. Castelli/Tran got good height on their opening level 3 triple twist, but the catch was not clean, leading to negative GOE. Their side-by-side jump combo was a double Salchow/single toe loop/single toe loop (instead of a triple combo), and their side-by-side triple toe loop was downgraded. They earned only about 2 points total on side-by-side jumps. They did complete both throw jumps (triple flip and triple Salchow). Their spin and lift elements were quite strong, and they brought nice emotion and expression to their “Woman” LP. Castelli/Tran scored 121.63 in the LP and 182.38 overall. Chelsea Liu/Brian Johnson placed 7th. After a strong short program, the team struggled a bit in the free skate. Liu/Johnson put out a level 4 triple twist and several strong lifts in their Spartacus LP. However, they struggled on all four jumping passes. Liu underrotated and fell on the triple Salchow, and failed to complete the planned double Axel. She also fell on the throw triple flip and 2-footed/put a hand down on the throw triple Salchow. It was a rough skate. Liu/Johnson scored 105.12 in the LP and 167.47 total. “Not quite what we wanted to do,” said Johnson. “But it sounded like everybody loved our in-between stuff, especially our choreo sequence. So I know the performance aspect was there, which is what we’re trying to focus on. So I’m happy about that.” He said it was “just one of those days” with the jumps. Jessica Pfund/Joshua Santillan placed 8th. Their Gone With the Wind LP was lyrical and pleasant to watch. They also hit some nice elements, including a good side-by-side triple toe/double toe combination and throw triple loop. However, there were also some mistakes. Santillan stepped out of the side-by-side triple toe loop, Pfund turned out of the throw triple Salchow, and their level 1 triple twist had a low catch. The couple’s closing star lift also came down early and earned no points—a costly error. Pfund/Santillan scored 103.10 in the LP and 163.62 overall. After a disappointing short program, Jessica Calalang/Zack Sidhu came back with a much stronger effort in the free skate to place 9th. Calalang/Sidhu’s Carmen long program was skated with nice spirit and style. It was entertaining to watch, despite a few technical errors. The couple hit a level three triple twist and a clean side-by-side double Axel/double toe sequence. Calalang doubled the side-by-side triple Salchow. Both throw jumps had nice height, but flawed landings (2-foot on Salchow, stepout on flip). Calalang/Sidhu’s lifts were good, with nice ice coverage and positions. And they kept the performance level high throughout. They scored 111.80 in the LP and 162.23 total. Erika Choi Smith/AJ Reiss finished 10th. Their Beauty and the Beast free skate was lovely to watch, with some beautiful transitions and choreography. Smith/Reiss showed smooth, well-done lifts and a light, easy level 3 triple twist. They also completed a double Axel/single toe combo and side-by-side triple Salchows (stepout from Reiss). However, their program was marred by two big mistakes on the throw jumps. Erika fell on the throw triple loop. Then their planned throw triple Salchow went completely awry, with Erika coming out one rotation early and falling awkwardly to the ice. It was a shame, as the rest of the program was quite beautiful. Smith/Reiss scored 108.08 in the long program and 159.03 overall. It was an eventful U.S. Nationals for the American pairs. We’ll next see them in action at Four Continents (Jan. 23-28), followed of course by the Olympics, which start Feb. 9.